This beautiful Bengal cat was brought into my Cheltenham photography studio last week. Although very shy to begin with, she eventually settled and we got some fabulous photos. I even got a chance to pull down the black infinity backdrop and play around with some different lighting arrangements. If you have a pet or animal that you would like photographed then I'd love to hear from you. Just give me a call on 07983 465414 or drop me an email using my contact page. All digital files included. No copyright restrictions. Thanks! I met Bella and her owner, Kirsten, in Pittville Park a week or so ago for this very fun photo shoot! I absolutely love photographing dogs and Bella was such a sweetie. She had a few clever tricks up her sleeve too! The photo shoot was just 30 minutes long but that always gives plenty of time to get the shots, and in this case, plenty of treats for Bella too! If you would like to book something similar then I'd love to hear from you. Please feel free to get in touch using my contact page or give me a call on 07983 465414. Thanks! I love photographing animals and must admit I was in my element when Sara Hulbert, from Hulbert's Country Feeds in Swindon Village, asked me to pop down to her farm to take some photos of her chickens for her website. Love these shots I managed to capture, hope you do too! I'm so passionate about animals and absolutely love photographing them. Eddie, Monty and Jack were three mad as a hatter Jack Russell pups. Totally banana's and totally fun! Gill, their adoring owner, was buying the shoot as a Christmas gift for her husband. I turned the photos around in super quick time, as I always try and do, and she loved the results. On Tuesday evening, The Mousehole was thrilled to open it's doors to Mrs Tiggy Winkle, a hedgehog who was small in size but big in character! To prepare for the shoot, I spent careful time picking out props that I thought might suit a tiny mammal. Having never worked with a hedgehog before, I was unsure what to expect. Would she freeze at the sight of me? Curl up into a ball for the entire shoot? Shy away from the flash of the strobe? Hah. She was a natural in front of the camera! She arrived in a very unassuming small, cardboard box. After being carefully unwrapped from her cosy nest, she was placed in my studio setting. She was very active and extremely inquisitive, nosing in suitcases stuffed with toys and old vintage buckets bursting with colourful balls. She was completely unfazed by it all. She was extremely patient with me and her handler, as she was carefully wedged into old boots, a child's wooden truck and asked to roll into a ball on demand! She was a star. An hour quickly flew by but it was the best hour I have enjoyed in The Mousehole so far. Having had a few photo shoots with me previously, Alex Parker bought her Dad, David, a gift voucher for a 30 minute location shoot for his birthday. The idea behind the shoot was to get some photos of him with his two beloved Collie dogs, 9 year old Katie and 5 year old Alice up on Cleeve Hill. It was an absolutely stunning evening; the light was magical and we had enormous fun trying to get Alice and Katie to sit still long enough for a photo! If you would like to book a similar photo shoot then please get in touch using my contact page or give me a call on 07983 465414. Absolutely loved photographing these two french bulldogs, who were brought into The Mousehole by their owner Sophie last week. Hank is just 2 years old, bought as a puppy by Sophie. Ronnie is 8 years old and was rescued by Sophie. Both had such fantastic characters, which I hope come across in the photos. I see all sorts of animals through the door of The Mousehole. If you have a dog, cat, pet snake or other animal that you would love to have photographed then drop me a line using my contact page or give me a call on 07983 465414. It was such a pleasure to photograph Esme for Nathan and Theresa. They own a dog grooming parlour in Gloucester called TK9. They were recommended to me by another photographer who has since retired. It's always great when someone shows a real appreciation for my work and what I'm trying to do but even more so when a fellow professional recommends me. "Your work is of a very high standard, but your prices are very reasonable, so I've no hesitation in recommending your services". This miniature poodle pup was super cute and super friendly, constantly trying to nose at the camera to find out what it was! If you'd like something similar please get in touch using my contact page or by calling me on 07983 465414. The Mousehole loves photographing all creatures great and small! This lovely little tortoise was a delight and only did one wee on the paper backdrop, which left us all chuckling! Honey is a little boy rabbit who was signed over from another rescue shelter as he didn't get along with a resident rabbit there. He is a very cute, very quiet little lop, who is probably the most static animal I've had in The Mousehole to date! He was so good natured as I asked the handler to hold prop after prop up to his face. He didn't flinch once! Since the photo shoot I am pleased to say that he has found a new home with another rabbit named Fudge. I'm sure they'll be really happy together! For more information about The Cheltenham Animal Shelter please visit their website at http://gawa.org.uk/. I've not had much experience of Chinchilla's so I had no idea what to expect. I suggested to the handler that he might like to pop him on the floor. Bad idea. He was off like lightening and we spent the next 10 minutes trying to catch him again as he darted among the props! 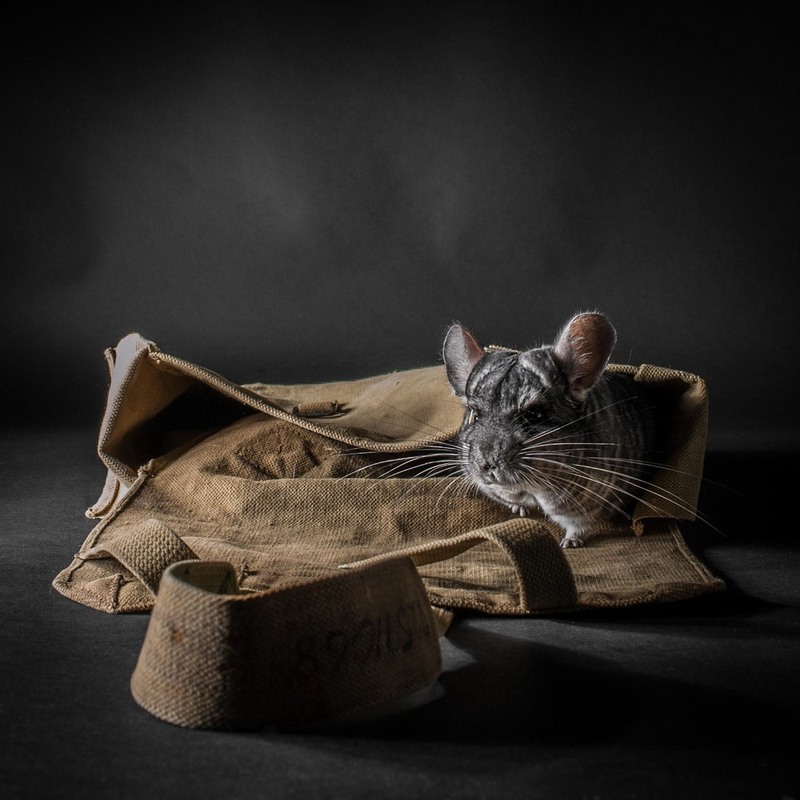 I was told by the handler that Chinchilla's love to hide in dark places, so I rethought my approach and plucked out an old satchel, which I'd found at a local flea market. Sure enough it worked, we managed to get the Chinchilla in the satchel and tucked in long enough for me to get into position with my camera ready for when he peeped out! This friendly little chap is still looking for a home. For more information please contact The Cheltenham Animal Shelter on 01242 523521 or visit their website at http://gawa.org.uk/. Cookie is a very cute little kitten with a very cheeky personality! He was bought into the shelter as the little girl of the family who he belonged t was allergic to him. Since the photo shoot I am pleased to say that he has found a loving new home. Matty is a beautiful Dalmatian. He was bought into the shelter with his Mum, as his owners could no longer look after them. Since the photo shoot I am pleased to say that both Matty and his Mum have found new homes.